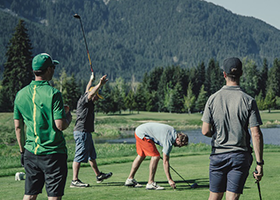 Treat your clients, your team, or even yourself by purchasing a Corporate Membership to the premiere, 36 hole facility- the Okanagan Club. Purchase a 25-round or a 50-round Corporate Membership before March 1 and receive up to 8 bonus rounds for FREE! Contact General Manager, Dan Matheson or Membership Sales, James Grassie for more information! Plus tax; based on 2019 pricing.